This post was sponsored by S&W Beans as part of an Influencer Activation for Influence Central and all opinions expressed in my post are my own. 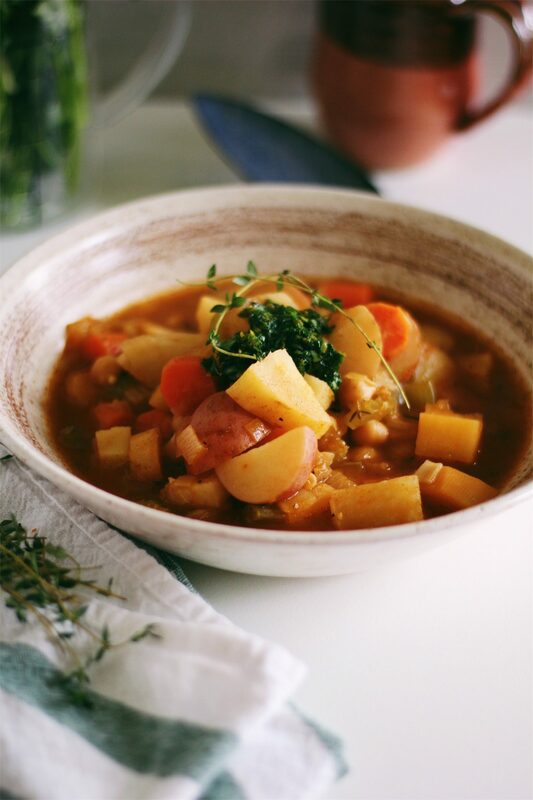 Vegan Irish Stew is hearty, healthy, and delicious. 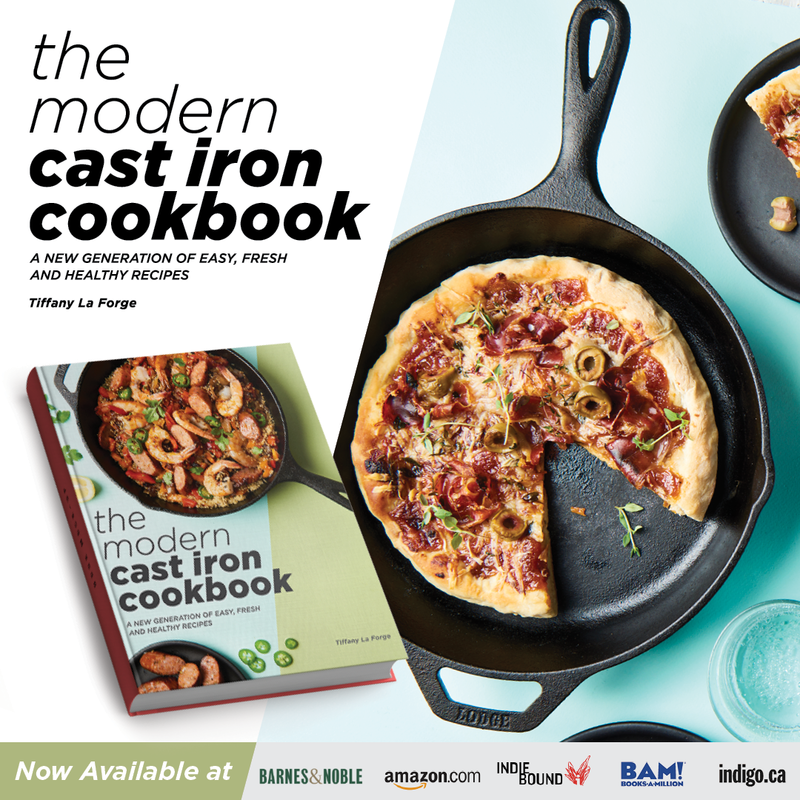 It’s layered with complex flavors, from caramelized shallot to nutty chickpeas to earthy root vegetables. Happy St. Patrick’s Day, all! As someone who is part Irish, this is one of my favorite holidays. We always went big for this holiday growing up. My grandmother would host every St. Patty’s Day. There was mustard-glazed corned beef, Irish Soda Bread, copious amounts of cabbage and potatoes, and Bailey’s on demand. There was also sometimes the heartiest and most savory Irish Beef Stew imaginable. Irish Stew is something special. I especially love it during this month, when spring is coming but not quite here yet and the nights are brisk. 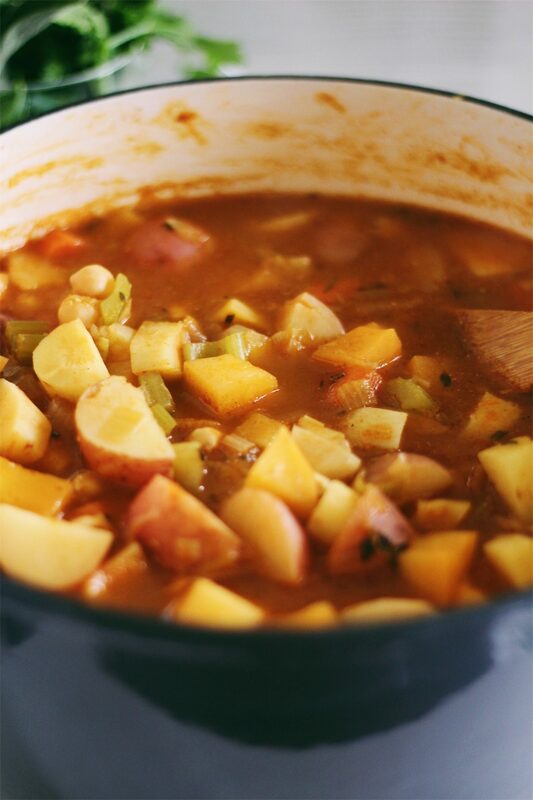 It’s the perfect time to take a big bowl of piping hot stew to the porch and cozy up with it as the sun sets. However, I like to keep the celebration rolling throughout the week. 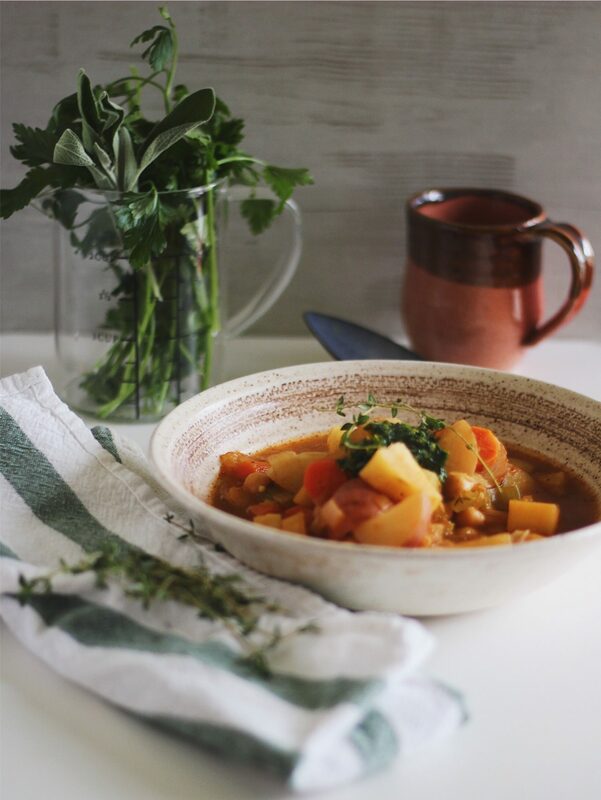 And what better way to do that than with a healthy, vegan Irish Stew? When I asked my mom if she wanted to try my Vegan Irish Stew, she lovingly said no. One of my favorite chefs is someone who I think cooks from the heart, just like my grandmother did. Yotam Ottolenghi is an Israeli-British chef who has written some of my favorite cookbooks (like Plenty and Jerusalem). He’s cooked at Michelin-starred London restaurants and has a Pastry Chef background, like me. He currently owns and operates several restaurants in London that focus on bold, Mediterranean-inspired flavors. One of my favorite recipes of Yotam’s is his “Irish” Stew. It’s a hearty stew that’s filled with lamb, wheat, shallots, turnips, celeriac, and white wine. 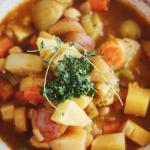 His recipe inspired this Vegan Irish Stew. 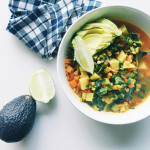 I love his idea of topping a hearty stew with a bright, fresh orange and parsley gremolata. I also love that Yotam caramelizes the shallots, something I love to do as well when it comes to creating savory vegetarian soups. But while a good meaty Irish stew is delicious, it’s also quite heavy. 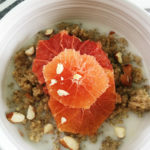 I took inspiration from Yotam’s recipe but decided to create a lighter, healthier vegan version. For this Vegan Irish Stew, I first replace the lamb with nutty chickpeas. 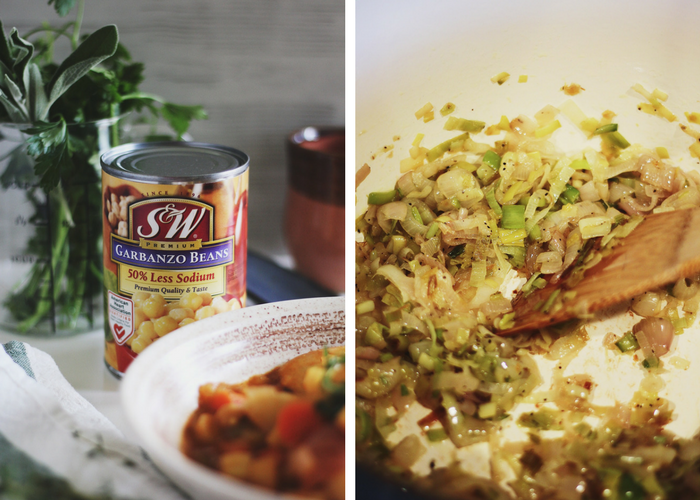 I love using S&W Beans, which not only give great texture to the stew but also makes it incredibly easy and convenient. S&W Beans has proven their consistent, premium quality for over 120 years and offer different varieties to suit your needs (Less Sodium, Organic). 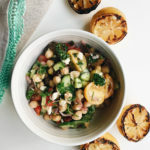 I love using S&W chickpeas to lighten up meals or to create a unique protein alternative. 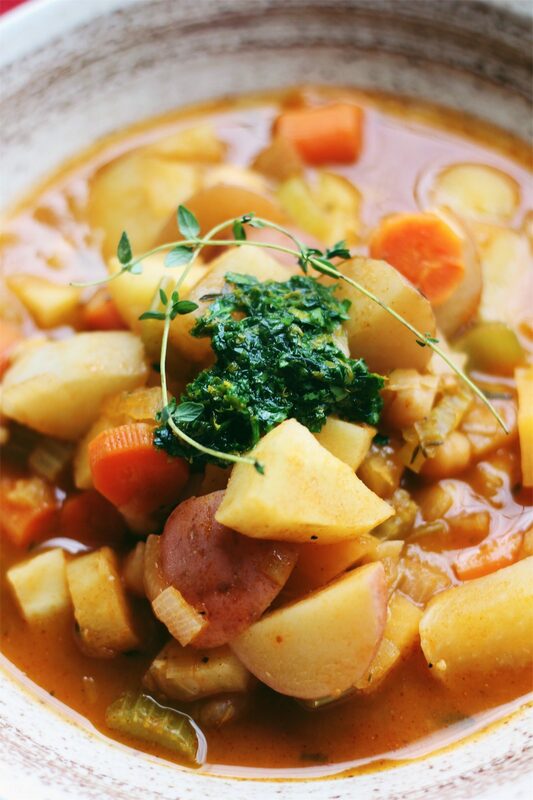 This Vegan Irish Stew is all about building flavors. Leeks and shallot are caramelized to deepen flavor. White wine adds welcomed acidity. Garlic, marjoram, thyme, and rosemary serve as aromatics. Tomato paste adds body. 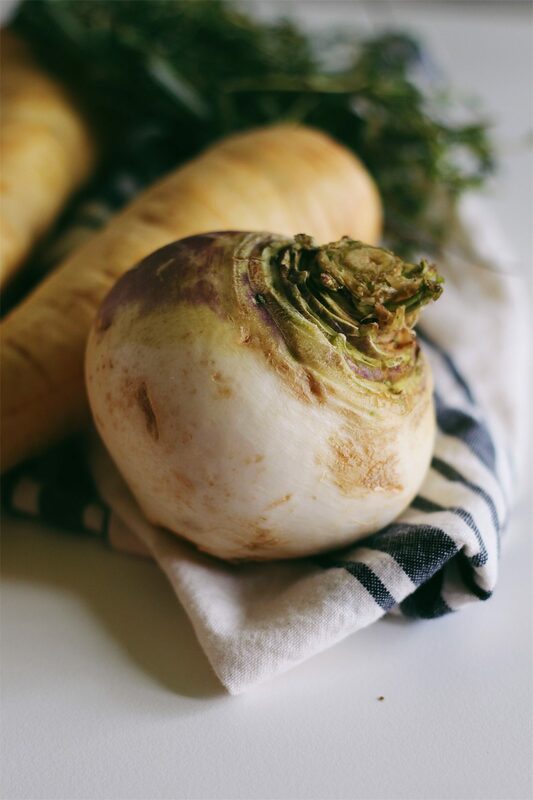 And plenty of root vegetables (parsnips, turnips, rutabaga) provide an earthy note that’s familiar to a rustic Irish stew. A fresh, bright parsley and orange-laced gremolata bring this dish together by supplying a refreshingly clever garnish. 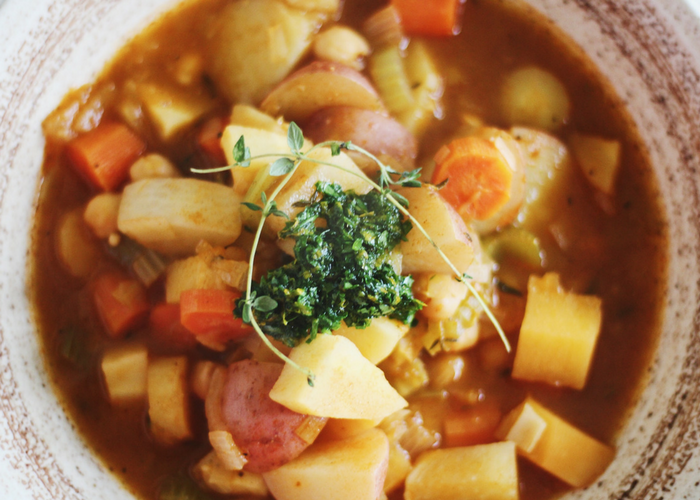 This Vegan Irish Stew might just replace my typical St. Patrick’s Day fare. And, bonus: it’s healthier, too. One serving of this Vegan Irish Stew has half of your daily fiber, 15 grams of protein, and is loaded with iron, potassium, and calcium. What are your favorite St. Patrick’s Day recipes? Let us know in the comments below. 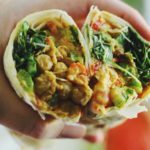 Check out S&W’s website for even more healthy recipes using convenient beans, and grab a $1 off coupon! 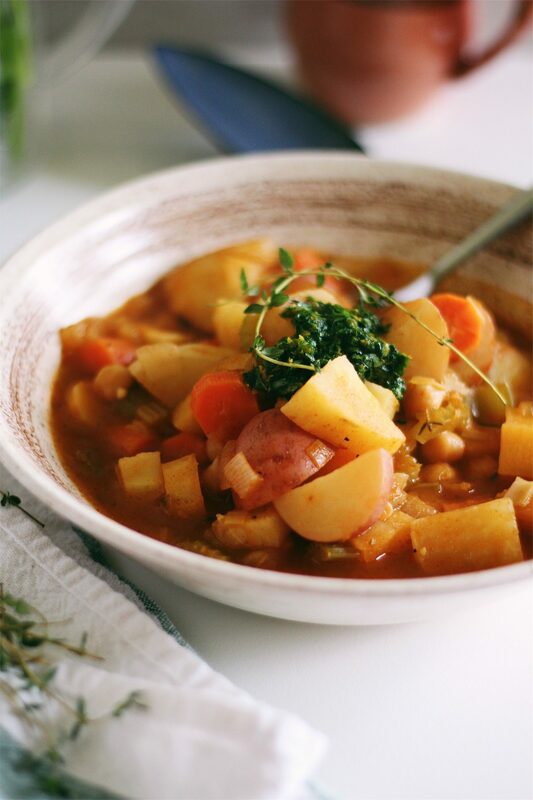 This Vegan Irish Stew is hearty, healthy, and delicious. 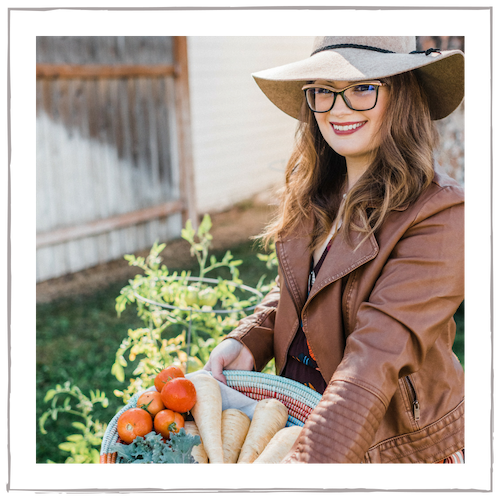 It’s layered with complex flavors, from caramelized shallot to dry white wine to earthy root vegetables. Make the Gremolata. Combine the parsley, garlic, orange zest, olive oil, and sea salt. Cover and set aside. Caramelize the Shallots and Leeks. Heat the olive oil in a deep pot or dutch oven over medium heat. Add the sliced shallots and leeks and stir to coat in the oil. Cook 5 minutes, until starting to soften, and sprinkle with the sugar and a pinch of sea salt. Continue to cook until golden and caramelized, about 25 minutes. The longer you let the onions slowly caramelize, the deeper the flavors will be. Make the Stew. When the onions are nice and caramelized, deglaze the pot with the white wine, scraping off any brown bits from the bottom of the pot. Let the wine simmer about 3 or so minutes until it’s reduced by more than half. Add in the garlic, carrots, turnip, rutabaga, parsnips, celery, and potatoes. Toss to coat with the onions and wine. Season generously with sea salt and pepper. Cook the vegetables a few minutes, adding more olive oil if needed. Add in the tomato paste, tossing the vegetables to coat. Add the broth, chickpeas, marjoram, thyme, and rosemary. Bring the stew to a simmer. Cover the stew with a lid and let simmer for 25 minutes. At about 25 minutes, remove the lid. Taste and adjust the stew for salt. Let the stew cook another 10-15 minutes more, until all of the root vegetables and potatoes are fork-tender. The stew will also thicken at this point as it slightly reduces. Serve the stew topped with a tablespoon of the orange gremolata. In a hurry? It’s okay to skip the caramelizing step, just cook the onions until softened and continue from there. But taking the time to properly caramelize the shallot and leeks will provide a world of difference. I don’t feel that this stew needs any thickening agents, as all of the starchy root vegetables and potatoes help it in that department. If you’d like an extra-thick stew, you can add a tablespoon or two of flour to the onions before adding the vegetables. Just cook the flour for 3 minutes. To keep the stew gluten free, you can thicken it with corn starch. Towards the end of cooking, mix 1 tablespoon of corn starch with 1/2 cup of the hot broth until completely dissolved. Add the mixture back to the pot, stir, and it will thicken immediately as it simmers. This stew becomes very thick as leftovers. I like to keep a little extra vegetable broth on hand to thin it out, if needed. Keep this stew chunky and rustic. 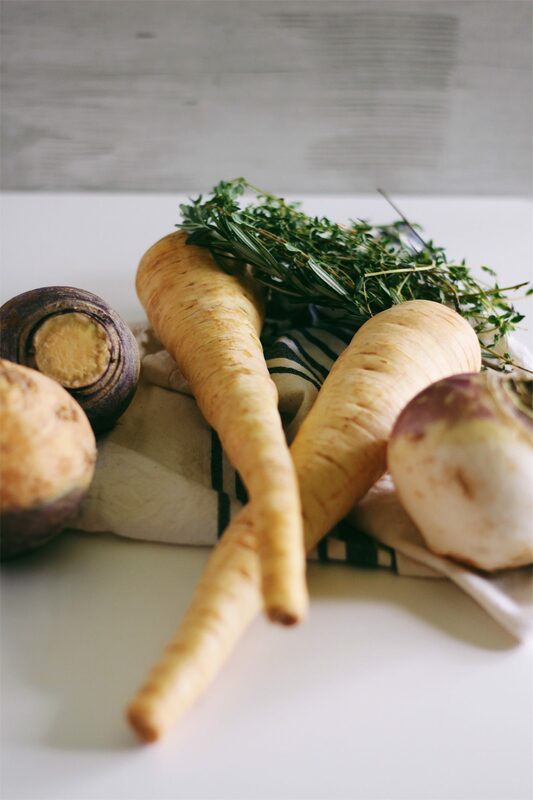 Cut the parsnips, carrots, celery, turnip, and rutabaga in medium-large pieces, but never any larger than the quartered potato. See photos for scale. My stomach is in an empty state when I read this. I have never had such an Irish dish before so I will try this soon! Thanks. I love a good hearty soup. I haven’t made this without beef, but it’s worth a try. It looks so yummy! That looks so delicious. 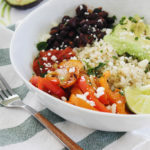 I have also never tried a recipe like this and would definitely love to give it a shot at some point! I never tried using vegetables like this. My mom always cooks with turnips but I have yet to try it out. I never had Irish stew before, let alone a vegan one! Both my brothers have lived in Ireland so they should be able to make it! 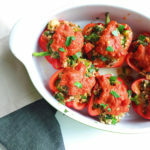 I will pass along this recipe for them!